Lessons of Hope… Project H.E.L.L.O. If I rewind five years, I recognize that the anticipation of the Christmas season was something I marked with commercial milestones such as the arrival of Costco’s Christmas aisle or the transition from white to red cups at Starbucks. Three years ago, in December of 2009, my students taught me the true meaning of Christmas. Our story began when a group of Best Buddies (our extra-curricular leadership students) asked if we could incorporate some visits to the Downtown Eastside as part of our leadership program. Our intention was to visit Hastings Street during the winter season and hand out food and clothing. A couple weeks before our visit I read an article in the Vancouver Province debating the merits of the social programs on the Downtown Eastside (DTES), questioning whether they helped or enabled the lifestyle. I sat wondering what it would be like to rely on handouts and I thought about the reasons we wanted to help. Recognizing that our students gained so much by giving, I began to question how we could give the homeless community the power to give during the Christmas season. I met with the Best Buddies, and suggested we make some handmade Christmas cards and offer the homeless community the opportunity to send messages to friends are family. Luckily our students embraced this idea and eagerly made our first cards. We assumed that many people would take the cards and give them to friends living in their community. We hoped that one person would decide to write to friends or family that they had lost touch with… but we had no idea what to expect. 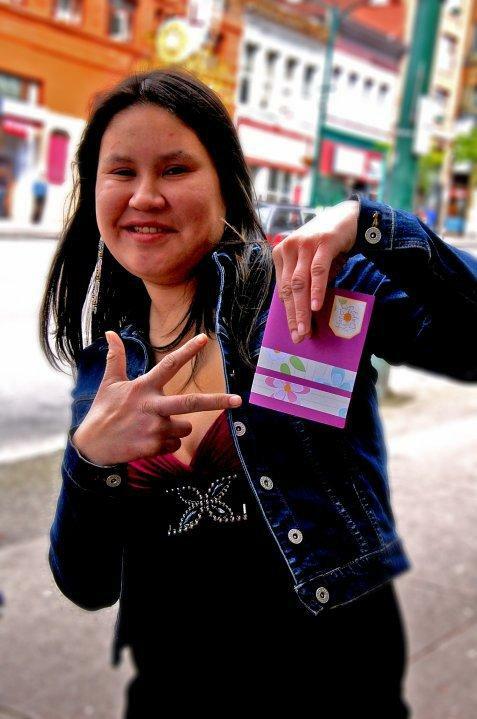 During our first visit, I headed to the DTES with three students and a handful of cards. It was late November and Christmas wasn’t really in the air, especially on Hastings Street. Cautiously, and somewhat awkwardly we initiated our first conversation with a woman named Sandra who stood in the cold leaning against Carnegie Centre. We asked if she would like to write a Christmas card to any friends or family. She smiled and asked if she could send two. She had limited dexterity and asked the students to write for her. Sandra chose two cards. The first one was for her daughter Samantha who she had not heard from in ten years. Last she had heard, Samantha had two children and was living in Alberta. She wondered if Samantha had more children now. She also wrote a card to her mom Noelle, wishing her a Merry Christmas. We promised Sandra we would do what we could to track down her family and mail the cards on her behalf. That afternoon, we left the DTES full of hope, as we had met seven people who had reached out and opened their hearts sending Christmas wishes to family they had lost touch with. The next day, students met in my office and we started to search the internet for possible phone numbers. The first calls we made were to Alberta, searching for Sandra’s daughter. On the second call, a woman answered and let us know her roommate Samantha was at work. We explained why we were calling only to learn that Samantha had assumed her mom had passed away after searching for her with no success. Samantha reached us, ecstatic to receive the card and learn that her mom was OK. She wanted us to let her mom know she was OK, and to let Sandra know that she had four grandchildren. 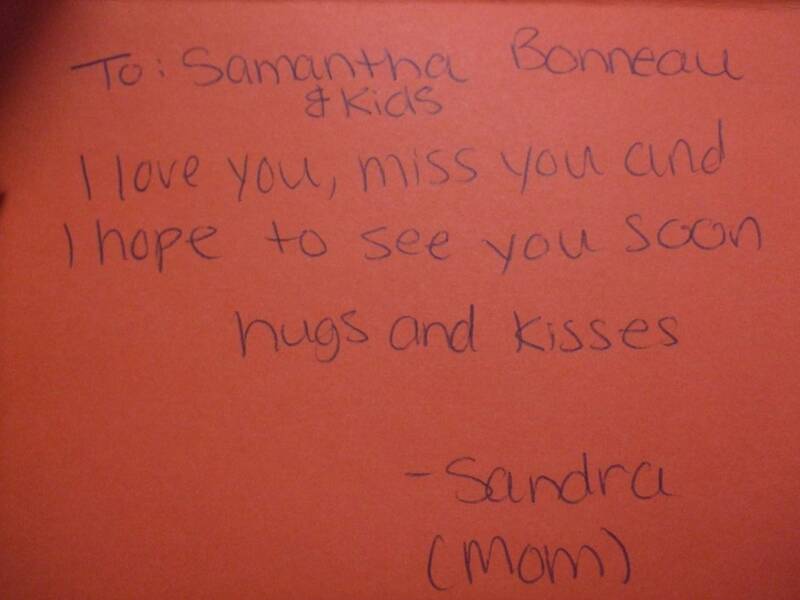 She also asked us to tell Sandra that her mom Noelle had passed away six weeks before our call. We knew we had to go back and find Sandra again… and we knew our project had just become so much more than a one day fieldtrip. We began to call our project ‘Project H.E.L.L.O.’ which stands for helping everyone locate loved ones. During that first season we took five trips to the Downtown Eastside. Word of our project spread through the media, igniting a fury of activity as citizens across the province wanted to help. Our students spoke to newspapers, radio and TV networks, sharing our story but also sharing names of people we were looking for. All of a sudden we had people who offered to help: community centres, pharamists, small town post offices, the BC Housing Commissioner, and compassionate citizens. From our first seven cards, we were able to find 5 of the families. We had set out hoping to help the homeless but we quickly learned that we were the ones gaining so much. We had never anticipated what our project would mean to the recipients of the cards, and we had not expected to hear so many personal stories about families impacted by poverty, drug use, mental illness and homelessness. We were so inspired by the lessons we were learning. In the spring of 2010, we received an email from Hawaii. Word of our project had spread to their state sparking action with social services groups wanting to implement Project HELLO to help their community. They decided to run a similar program offering Mother’s Day cards. We loved the idea and followed suit, preparing Mother’s Day cards and returning to the DTES. Again we were overcome with gratitude as the homeless opened their hearts and entrusted us to deliver their messages. Many also embraced the opportunity to send updated photos home to their moms. We returned to the internet and the phones trying to find families. 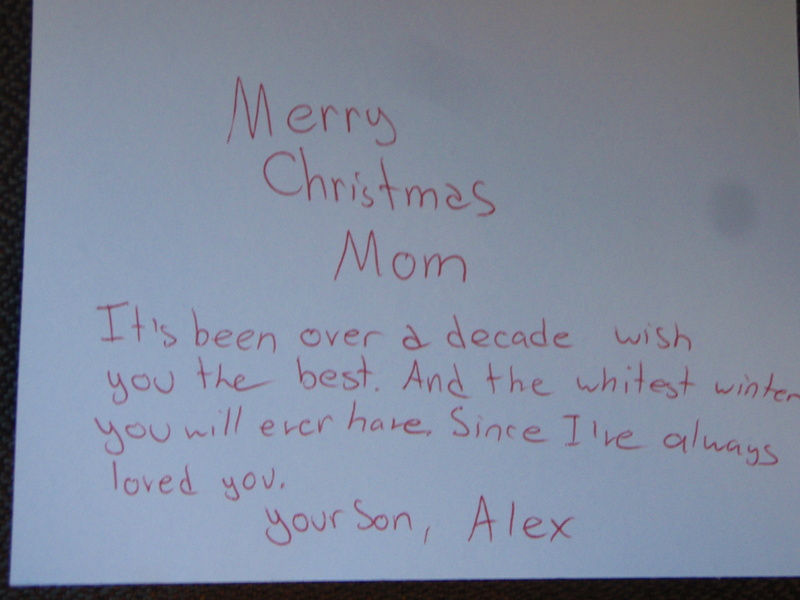 Our students received heartfelt notes from the moms, many who had not heard from their children in years. We also received notes from mothers not impacted by homelessness who were just touched by the story and had a new appreciation for their relationships with their children. Again the community reached out and helped us make connections. Our students surprised Sandra and Samantha with a Mother’s Day gift they will never forget. Our students fundraised and arranged for Samantha to fly to Vancouver for a weekend with her mom. Together we watched them reunite at the airport, share family photos and catch up on lost time. They re-opened the lines of communication and promised to stay connected. Although many of our students were nearing graduation, they made a commitment to continue with Project HELLO. Now, three years later, we are about to begin our 4th season. Local elementary schools (Coquitlam River and Baker Drive) have joined forces and are making beautiful cards for our project. Our alumni continue to be involved, speaking to schools and community groups about our project, managing our website (www.projecthello.ca ), and mentoring younger students as they begin to volunteer with Project HELLO. Our students have also become actively involved in volunteer work at the local homeless shelter in the Tri-Cities. To date, I am incredibly proud to share that our students have helped make 261 connections. Personally, the journey with our students has been one of the most meaningful experiences of my life. It has taught me the power of human connection, the importance of family and the positive difference our students can make when they help strengthen others and develop a strong sense of social responsibility. I have learned that everyone has a story worth hearing, and that hope exists, even in our darkest neighbourhoods. And so, as the leaves start to change colour, and others are thinking about Halloween, I am eagerly anticipating the Christmas Season and our fourth season of Project HELLO. Next week our alumni will help me share our story with our new students, and we will again begin our journey of shifts at the homeless shelter and card making for our fourth season. Together, we will continue to learn ‘Lessons of Hope’ and discover the true meaning of Christmas. This entry was posted in Community, Leadership, SD43, Student learning, Uncategorized. Bookmark the permalink. ← The 5 F’s for Fabulous Meetings….